News - Audi Hungaria – The Company - AUDI HUNGARIA Zrt. Győr, 7 March, 2017 – AUDI HUNGARIA Zrt. 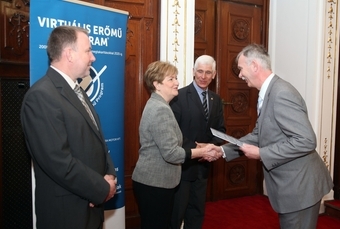 received the Award of Excellence in Energy Efficiency from Magyar Innováció és Hatékonyság Nonprofit Kft. (Hungarian Innovation and Efficiency Nonprofit Ltd). Zsolt Zentai, the company’s factory design manager accepted the award yesterday from Katalin Szili, patron of the Virtual Power Plant Program (Virtuális Erőmű Program™) during a formal event in the assembly hall of the Ministry for National Economy. 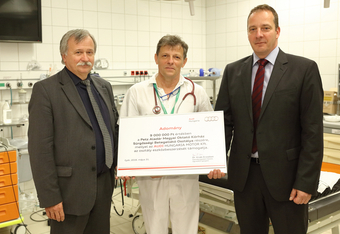 Győr, 13 February 2017 — In terms of social responsibility, Audi Hungaria has supported the healthcare of the region with a recent donation. The aid enabled the stroke center at the Central Ward of Anesthesiology and Intensive Therapy of Aladár Petz County Training Hospital in Győr to purchase two respiratory devices, which greatly contributes to the enhancement of healthcare services. Győr, 07 February 2017 — Audi Hungaria is the biggest industrial geothermal energy consumer in Hungary. 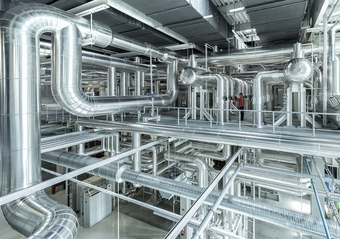 Since its switch to green energy, the company has used 100 GWh of geothermal energy and has reduced its carbon dioxide emissions by 20,170 tons. Győr, 14 September 2016—Nora Mørk, the new player of Audi ETO KC Győr will start the season with an Audi A4 Avant. The car was presented to her by Dr. Csaba Bartha, Head of AUDI ETO KC Győr and Péter Lőre, Manager of Communication and Government Relations at Audi Hungaria. The Norwegian world-class handball player is fast as lighting. So now, on the roads, the Audi A4 Avant, equipped with a 2.0 TDI engine, will provide her the same dynamics to which she is used to on the court. • Pupils could take the new school complex in their possession in September. • Thomas Sigi, Labor Director and Member of the Board of Management of AUDI AG with responsibility for Human Resources: “With the Audi Hungaria School we can support education right from childhood. 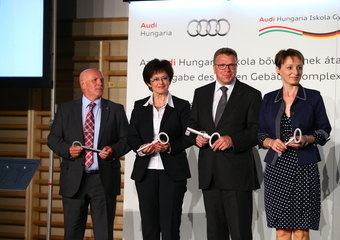 • Dr. Elisabeth Knab, Member of the Board of Management for Human Resources of Audi Hungaria: “This institute can become one of the most modern schools in Hungary”.